I'm so excited to be partnering with Brass Clothing for this post. One of my favorite things about launching my business has been collaborating with other female entrepreneurs, and to be partnering with a female run company like Brass has been such a pleasure. Their brand is genuine and intentional, and their beautiful pieces reflect that. One of my goals this year is to live more sustainably, and I knew I wanted to work with Brass for that purpose. They manufacture their clothing in ethically approved factories in China. You can catch glimpses of their production process on Brass's insta-stories and throughout their social media content. As a consumer, their transparency in manufacturing makes their brand unique and approachable. Making the transition to sustainable living can seem overwhelming but brands like Brass make it encouraging and less daunting. Each piece is thoughtfully curated for women of all body types, which I also admire. Brass’s style is more minimalistic and the style is meant to be timeless and transitional. In the past few months I’ve wanted to acquire more high quality versatile pieces to my wardrobe, so when the opportunity to try the A-line dress came up I couldn’t resist. A high-quality accessibly priced dress that is also timeless can be hard to come by. Some of the ones I’ve tried in the past didn’t give enough coverage and the fabric felt too light and not durable enough. Immediately when you pick up the A-line dress you can feel the difference. The fabric feels durable and when you slip it on it feels like the perfect amount of coverage. A white dress that doesn’t require too much fuss is hard to come by, and this A-line dress lives up to its reviews. As soon as I tried it on I didn’t feel like I’d need an extra slip to wear underneath, which made me extremely happy because I’m not the biggest fan of lots of layers (especially as the months get warmer). I have been obsessed with white for the past couple of months, and I knew that either black or white were so versatile and could be dressed up or down. Even though the white might seem as something only to be worn in spring and summer, I knew that I could make it work year round. I packed this baby up in my suitcase and hauled it cross-country to find it perfectly wrinkle resistant. Of course it had a few minor wrinkles but as soon as I slipped it on the minor lines on it went away after wearing it. By the time I left our apartment it was totally good to go. This dress is honestly the perfect travel dress. You can dress it up with your favorite heels and accessories or dressed down with your favorite sneakers and baseball hat. I literally wore it three different ways in one day, that’s how good it is! I didn’t document the three different ways in one-day look, but I did document how I dress it up or down. For the first look I wore my favorite bandana from anthropologie, with my gigi pip Scottie hat and yellow mules. I seriously love how I can wear a cute pair of shoes and a fun scarf and already feel a little more sophisticated without having to change my entire outfit. Even if I had just worn my mules with a fun pair of earrings that would suffice for sophisticated for me. In the past couple years I’ve slowly acquired a simpler taste in style. But if the occasion required a dressier look, then I could definitely accessorize and feel modern and chic. I wore this look to an Easter brunch with family, to church and to stroll around the city. I know that I can easily wear it anywhere from brunches to weddings. For the second look I opted for something more relaxed. I tied my jean jacket around my waist and swapped my mules for my tevas and wore my favorite baseball cap. The versatility of this dress is what makes it so fun to wear. I wore this look on a Sunday walk along the lake here in Chicago, and felt completely comfortable and relaxed. Even if the white might seem high maintenance, it’s so easy to care for, just machine wash! Honestly, if you have a full day of a variety of events that require different looks this dress is a must. 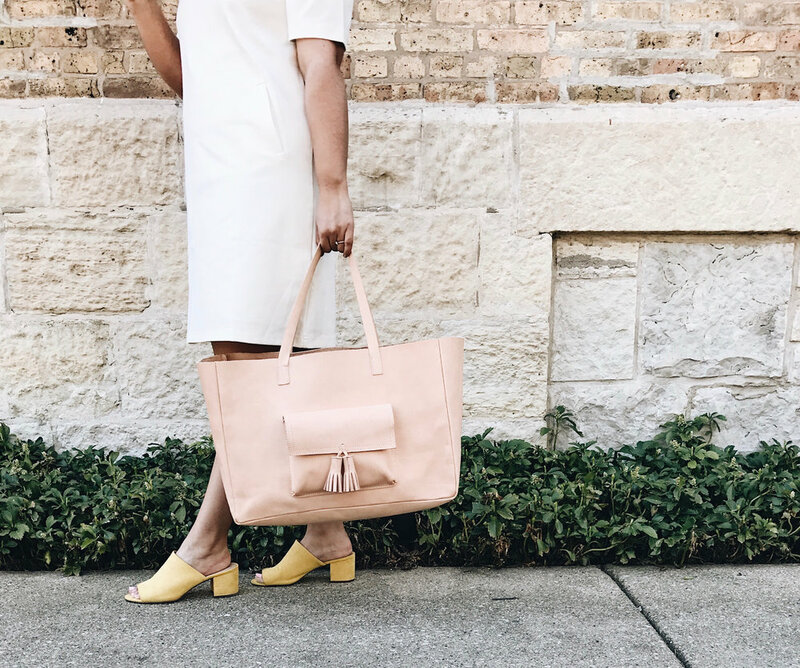 You won’t need to hurry home and change your entire outfit, but instead carry a few of your favorite accessories and a change of shoes and you’re set. Another thing I loved about this dress is the fit. A-line’s can seem like an unflattering option for some body types, but because Brass is so mindful of the woman they’re dressing this dress makes you feel like it was made for your body type. I am petite height-wise but have curvier hips and legs. I loved that this didn’t make me feel like I was wearing something super boxy. It falls nicely and didn’t make me feel like I was hiding my body under a boxy dress. Plus, it has pockets! Who doesn't love a dress with pockets? So if you're looking to add some versatility to your wardrobe check out Brass for their beautiful high quality pieces that celebrate every woman's body!